The Liberation Music Collective, a contemporary jazz orchestra founded by recent graduates of Indiana University’s Jacobs School of Music, is charting a course as a conscious-raising group advocating for social justice and equality through poetry and music. On LMC’s bold 2015 debut, Siglo XXI, each of the album’s tracks focused on current social or political issues. For their sophomore release, LMC takes a different approach. As the title suggests, Rebel Portraiture “honors the individuals whose courage and commitment call attention to oppression and injustice the world over.” These individuals, both contemporary and historic, have another common thread—each lost their life while valiantly fighting for a cause. 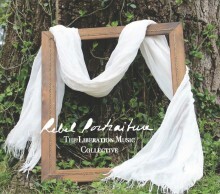 Liner notes by Latin Grammy Award winner Kabir Sehgal further illuminate the lives of these individuals and the compositions on the album. Hannah Fidler and Matt Riggen, co-founders of LMC, composed or arranged the majority of the works on the album, drawing upon a multitude of genres, influences and instruments. For example, the opening track “Passing Away” is based on a sacred harp hymn and recalls the life of Giles Conery, who was killed during the Salem Witch trials “during a beautiful display of resistance” echoed in the trumpet solos by Riggen. Many of the tracks are paired, offering more than one tribute to fallen heroes. “An Afterlife for Jeffrey Miller” and “Kent State” honor the four students killed by the National Guard in 1970 while protesting against the Vietnam War. The former, drawing upon a protest poem composed by Miller shortly before his death, is one of the more arresting tracks on the album. The spoken poetry is woven into music that begins in a more traditional Copland-esque style before shifting into Gil Scott-Heron territory. Another pair of tracks memorializing Syrian and Iraqi journalists killed by ISIS also effectively employ spoken word: “An Afterlife for Ruqia Hassan” recites (in English) an abstraction of the oldest verse from the Qur’an, while “Iqra” features both spoken and sung text performed by Fidler. The remaining tracks also reference more recent deaths. “The Afterlife of Berta Cáceres” honors the Honduran indigenous environmental activist using an arrangement of a traditional Ghanian funeral song performed primarily on gyil, percussion and bass. “Ditchside Monument” and “An Afterlife for Noxolo Nogwaza” are dedicated to the South African LGBTQ+ activist killed in 2011. The latter “Afterlife” track features an extended bass solo by Fidler before concluding in a chorus based on the Bantu words handziyah (ascent) and kurhula (peace). Rebel Portraiture closes with “All I Need,” bringing in the entire ensemble to perform LMC’s “anthem for the rebels of today and the heroes of tomorrow” in a glorious demonstration of solidarity. This entry was posted in Classical Music, Jazz and tagged 2017, 2017 releases, activism, AD Astrum, album review, Bloomington, Brenda Nelson-Strauss, CD review, Indiana, Indiana University, Jacobs School of Music, martyrs, musical activism, revolutionaries, Siglo XXI, The Liberation Music Collective by aaamc. Bookmark the permalink.